I've been reading Weslager's "Delaware's Forgotten Folk, The Story of the Moors and Nanticokes," the book that everyone said would help to put it all together for me. Well, I have to say it has. One of the things that helped was understanding the mess created by the school problem in early twentieth century mixed-blood communities in Delaware, problems that affected attitudes and divisions among people during my mother's and her peers' lifetimes. Also, of special interest to me was the notion that the so-called 'Moors,' the people my grandfather identified with, were one of the remnants of the Lenape (Delaware) native peoples, probably the ones living furthest south in that time of major movement of refugee people. My husband's people were also probably part-Lenape, and so that confirms something he and I have felt for a long time. I've decided I don't feel comfortable calling myself part-native-american or part-african-american, more comfortable calling myself part-white or simply 'white' (with reservations, no pun intended). However, I do feel comfortable acknowledging that my family had a 'moor' lineage. My chinese daoist teacher, Jeffrey Yuen, talks a lot about our inherited constitutional factors, which relate both to our genes and to our past lives, and he refers to getting in touch with our lineage. That message has been very timely for me, since that seems to be exactly what is happening in my life. Outside knowledge or information is somewhat helpful, but the main stream of the lineage comes from within myself, from my own memories of my family, my early environment in Philadelphia and south Jersey, my own experiences. Also, there is quite a bit of dream material that relates to our lineage, which of course I did not recognize until recently. I've also really come to understand that my father, a sailor, was not exactly an 'immigrant' to this country. As a seaman, he traveled all around the world, and of all the possible places he chose the Delaware River area because he really just loved the indigenous people there. He chose my mother because he loved her and because she was one of those people he already loved. I think it came as a bit of a shock to him, a Dane by birth, that - possibly because of me - my mother was trying to distance herself from her people. Oh, the ironies of life! But - well, I don't know if you can understand this, but - it's been something of a healing for me to realize all of this. There was something missing inside me, or some rift within me, that this knowledge has healed. It almost feels strange to share this in such a public forum, but I do so in the knowledge that sharing this may help someone else. Somehow all of this has been buidling to some kind of completion - or so it has felt to me - just recently, so imagine my surprise when I went to the mitsawokett site (the official delaware moor site) yesterday and found that they have posted my family's pictures. I felt I might not have consclusive enough proof that my great-grandmother was the same Mary Carney born in Delaware somewhere between 1832 and 1835. But I knew that she and her son, my grandfather, saw themselves as 'moors,' and that her mother's name was Louisa. Likely that her father's name was John, as well, since that is what she named her first son who was born out of wedlock. It does help to be able to put a name to my experience and to understand the kinds of conflicts that drove my mother in a color-conscious society such as Philadelphia's was in her day. But even more than that, it establishes a warm feeling inside me about myself and my mother's family, and my father's love for her. Out of that love I came. Maybe what 'being a Delaware Moor' had come down to, in my mother's day, was just the hoarding of 'old stuff' with no real 'meaning' behind it. I get the impression that there were a few distinctive mannerisms, a sense of identity (both imposed from outside and nurtured within the community), and a proclivity towards certain images, such as the many variations of stars: eight-pointed, sixteen-pointed, thirty-two pointed. There were racial 'issues' - those were real, and not just 'old stuff.' The Moors are reputed to have denied being white, black or native. "We are Moors," was their statement of ethnicity, according to most sources. I think my mother thought she was secretly colored, or might be perceived as 'colored,' but she wanted to be white. Back in those days, 'colored' was a term that embraced a myriad of people, including the Delaware Moors. I notice that in Pennsylvania my great-grandmother was listed as white on the census, but in Delaware, mulatto. Her cousin (or nephew, can't remember which just now), William Carney, served in the Colored Troops during the Civil War (Pennsylvania), but according to various sources I've read, 'colored' could mean 'native american,' too. My grandfather was a follower of Noble Drew Ali and his Moorish Science Temple, and I was brought up to revere Egypt as the source of our culture. Yet many of the descendants of the Delaware Moors today seem especially focussed on their Nanticoke ties. Well, I have just recently joined a Yahoo group of descendants of the Delaware Moors, so maybe I will know more soon. 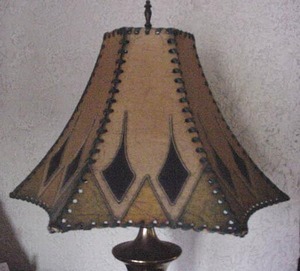 I loved this leather lampshade when I was a little girl. At that time, it sat atop a rounded orange glass base and had a plain little ball on top rather than this finial. If my theory is correct, and my great-grandmother was one of the 'Delaware Moors' then perhaps this shade was made in imitation of the kind of work their forbears did in the past. It's obviously a modern adaptation, not something from the old country. My mother was amazed and somewhat disturbed that I 'liked' this piece so much. But I absolutely loved it, especially when it still had its orange glass base. I got a wonderful feeling from it. On the other hand, my mother was convinced that it was ugly. I think it worried my mother that I liked all the things that had belonged to her grandmother, with whom she obviously had a very conflicted relationship. She didn't approve of that 'Delaware Moorishness,' and from what I've been able to read about them on-line, they were a group of people who for so many years 'lived apart' and had their own ways. Written about at the turn of the last century, an author stated that they still kept to many of the old 'moorish' ways, but he did not enumerate any of them. I'm recollecting those pieces of coin jewelry, this leather lampshade, my great-grandmother's Tuareg cosmetic case, dagger, and Moroccan tea-glasses. Perhaps these are some of the things he was referring to. Anyway, I think my mother wanted to assimilate, and found this branch of the family 'too backward' - this was the reputation of the Delaware Moors in my mother's day, let's say, the 1920's. They don't seem to really exist any more. The 1970's opened the way for them to really assimilate, I suppose. They are now a part of America's past. Still on my quest for familial knowledge. 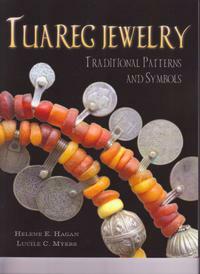 I've found this absolutely beautiful book that must be 'the last word' on Tuareg jewelry, and it is available from the author Helene E. Hagan, or at Amazon.com and other places. When I began looking at the work in this book, my first thought was exactly the same as my thought about our necklace - you may recall I am trying to remember the details of a necklace that was in our family - and that first thought was, 'this is just a bunch of scratched lines - is that all this kind of jewelry is?' So, that was my first clue that the jewelry in this book was indeed related to our necklace. There is one big difference between the jewelry in this book and ours, and that is that the jewelry in the book is exceedingly beautiful. As I recall our pieces - we had others besides the necklace, although the necklace remains most vividly in my memory - my memory tells me that our pieces were much more plain and, as it were, crude by comparison. In fact, I wondered if the necklace might be something other than Tuareg, perhaps gypsy or Native American. A lady on the Nanticoke page wears a coin necklace, for example, although it is hard to see. When I asked my mother why there was a necklace made of coins among her costume jewelry, she said very dismissively, 'oh, the old-time people used to make them like that.' 'Who were the old-time people?' No answer. The Delaware Moors were apparently related to the Nanticoke at one time, so I wondered if perhaps our coin necklace might be one of theirs. Well, when I finally came across this picture, I realized that at last I'd found something I recognized! 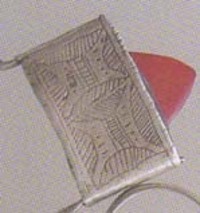 Yes, this motif, crude and unsymmetrical as it is, was on our coin necklace. This is the kind of 'look' our coins had - very uneven shapes, not centered, imperfect, mere 'scratchings,' etc. 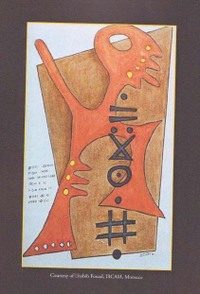 From this book I also recognize the 'star' design, and others. In addition, I realize that some other pieces that my mother let me believe were merely costume jewelry, were in fact a kind of cylindrical men's 'brooch.' Some of the other specific kinds of jewelry in the book may have been among our collection as well, but I don't recall them as clearly. As you may recall, I've been cudgeling myself over losing the antique coin-necklace, but I do remember it, so let me try to describe it for you. The coins were strung together with very simple large link chain. The largest and heaviest coins were in the middle. My recollection is that they were all sanded on one side, and stamped with designs like the 'prickly crescents' I described in a previous post, and with other shapes as well. On the reverse, they were quite dirty old coins. One in particular had a huge serpent with many 'turns' or 'coils' to it. I always feel I would recognize the coins if I could see them, but I do recall that they weren't a lot of the European 'heads of state' kinds of coins. We used to have a coin purse full of Arab and Iranian coins, with swords or lion-and-sword motifs, but I always thought they were gathered by my father. In this assumption, I now know I was wrong, but just which coins came from him and which from my mother's family I can no longer discern, as all those old coins have been mixed and some given away. Anyway, if I remember rightly, the largest coins seemed to have a layer of metal around the outside to protect the edge, and/or to make the necklace heavier. I read somewhere that Berbers valued less the size of a necklace and more its weight. In any case, this necklace was a very poor one compared to many that you see in books displaying Berber jewelry. I can't remember if it had two or three tiers and I believe it had five or six drops. The two outside drops were made of very small thin coins that had been polished to a very light sheen and were slightly curved, as if placed over a finger-tip and smoothed until it fit the contours of a finger. At least, as a girl, I used to press my fingertip inside these curved coins and they fit perfectly. I've just ordered a book called "Tuareg Jewelry" and I'm hoping to find a similar example there. I'm also keeping an eye out for the kind of short sword we had in the family.